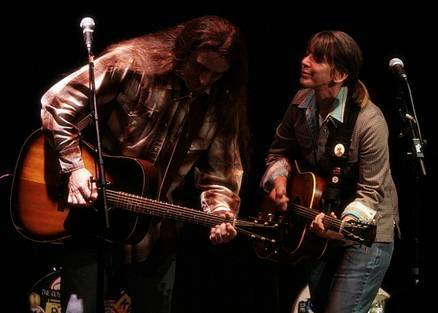 It’s been a long time, fourteen years in fact, since husband and wife duo, Stacey Earle and Mark Stuart quit the pursuit of major label recognition in Nashville. What they have missed out on the trappings of industry fame has surely been compensated by the preservation of their musical integrity and the creation of an act that really knows how to interact with the dedicated followers of americana music. Their continued desire to spend a considerable amount of time on the road currently sees them on an exhausting fifty shows in sixty days tour of the UK and Europe. In line with many of their intimate venue and house concert gigs, their return to the Kitchen Garden Café in the eclectic Birmingham suburb of King’s Heath gave them the opportunity to perform to both old and new fans alike. The major difference between their 2010 and 2012 visit to the UK is that this time they are promoting a new album. Despite writing and performing many songs over their 20 year musical collaboration career, there hasn’t been the commercial pressure for a constant stream of studio album releases. Therefore the couple were enthusiastic to perform a series of tracks from this new album titled ‘Dedication’ with probably the best one being one of their first few numbers of the evening, a road song called ‘Little Rock’, very much an autobiographical piece of work for this well travelled duo. Another track from the new album, ‘Here comes the Pain’, led to Stacey commenting on the challenges of transferring this piano based song from the studio to a double Gibson guitar live set. Having listened to both versions, they have successfully overcome this challenge. Probably the best feature of their shows is the opportunity for Mark to demonstrate his highly capable finger picking guitar skills and he ties this is in conveniently with his confessed love of old time music especially the blues. With this old time link, he thoroughly entertained the audience in the first half of the set with his version of the song ‘Midnight Special’ made famous by the American roots/folk legend Leadbelly . In the second set, he displayed his skills with a solo instrumental version of the 1920’s tune ‘I’ll See You In My Dreams’. After which Mark stood aside and allowed Stacey to captivate those present with a ‘part sung-part spoken' track from their new album called ‘This Ol’ Flag'. The evening also contained plenty of popular songs from the duo’s back catalogue including ‘I Don’t Want To Have To Run’ and ‘Are You Ready?’ recorded on their 2005 album ‘S & M Communion Bread’ as well as a requested tune from one of Stacey’s solo released albums titled ‘Dance With Them That Brung Ya’. These along with all the other songs performed on the evening were delivered with infectious enthusiasm to complement the impressive harmonies and expert guitar accompaniment. The duo don’t reflect much on their association with Stacie’s brother Steve in the 1990’s, where they had stints with his band The Dukes, but Mark did comment towards the end of the show on how they had decided to record his originally penned version of the title track of new album ‘Dedication’ and not the one that had been modified during a collaboration with Steve. This song was the penultimate one of the evening leaving the usual Stacey Earle and Mark Stuart show closer, ‘Up In Annie’s Room’ to bring this enjoyable concert to a conclusion. For Stacey and Mark, it’s bags packed and onto show number thirteen of the tour while the Kitchen Garden Café music regulars were left to reflect on another privileged show from two top quality US touring artists who are prepared to showcase their talents in a ‘living room like' experience, three thousand miles from their Tennessee home.